Up early, ready for the long ride back to the Atlantic Coast, we were once again slightly thickheaded from the excesses of the night before. 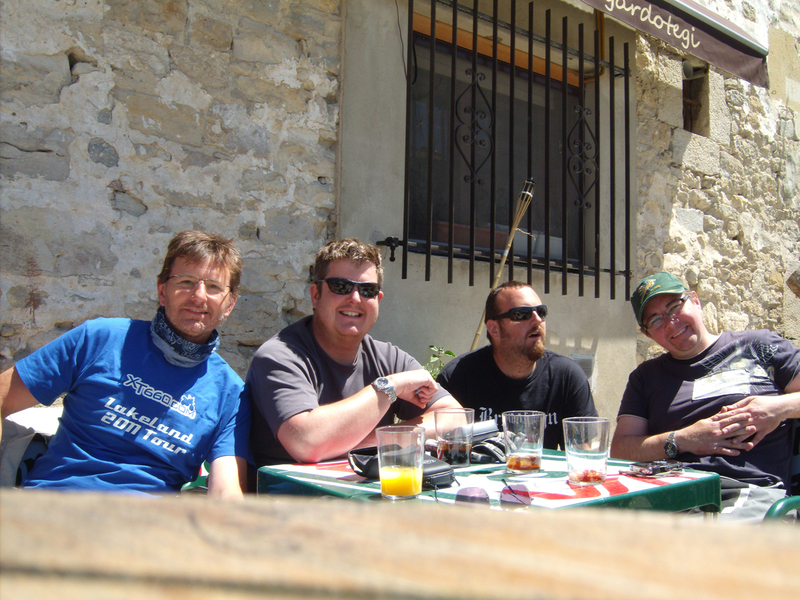 However, the morning cobwebs were quickly banished by some strong coffee and the knowledge that we had a long way to go. We were quickly packed and ready to go and pulled out of the campsite before there were very many other people up and about. 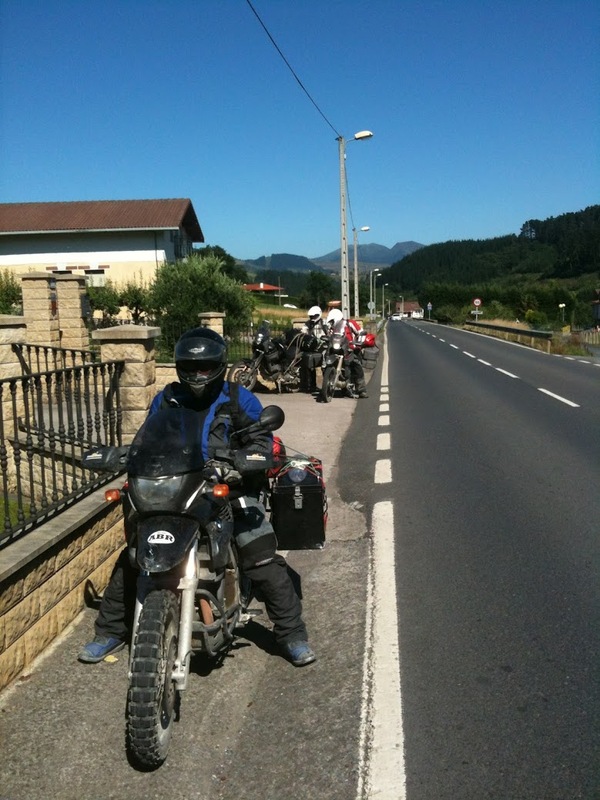 I’d had an extremely circuitous route back to the coast near Bilbao planned for us taking in several national parks and some wicked looking twisties but, the evening before in the bar, I’d chopped a big loop out and cut the route by a hundred miles and 3 hours or more – it would turn out to have been a wise move! 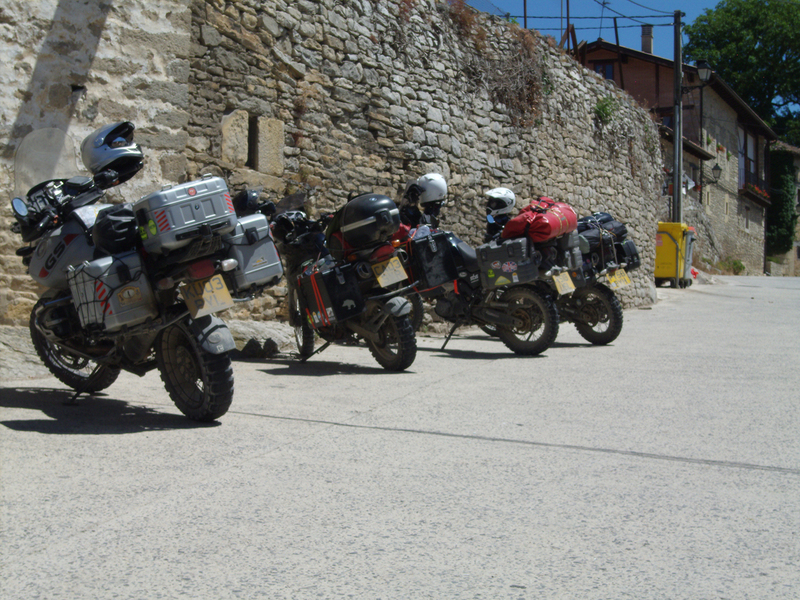 After a quick stop at the local petrol station to brim our tanks for the long day ahead we headed back towards Tudela and, for the first time in the trip, actively sought out a major road. We had some distance to cover before we hit the good stuff again and, having struck out from camp with just a coffee, there was also a good chance we’d find some breakfast along this main route. Sure enough, after 3/4 of an hour or so of uninspiring and fairly miserable riding, looking at the backs of an endless succession of trucks, we spied a roadside cafe and pulled off into the car park. There were a couple of squad cars parked up outside and cops at the bar tucking into their breakfast – local law enforcement patronising an establishment is always a sign that the food’s good! We commandeered a small table outside, knocked back more strong coffees, wolfed down bocadillos of chorizo tortilla and watched the trucks thundering by for a few minutes. After another hour or so on the main road we finally turned off and followed the TomTom which led us through increasingly tiny villages with matching tiny roads. 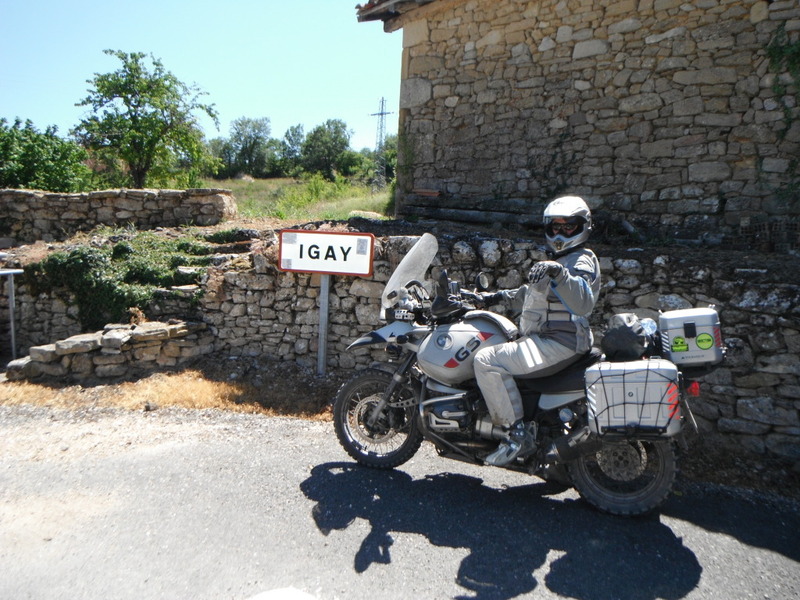 Some villages were simply too hilarious not to stop for a quick picture! As lunchtime loomed we passed through another tiny village and spied a roadside bar/restaurant. They were offering a 10€ 3 course lunch which proved to be a fantastic deal and, along with some refreshing drinks just the ticket to fuel us up for the afternoon ahead. Our passing through this tiny village was no accident however. 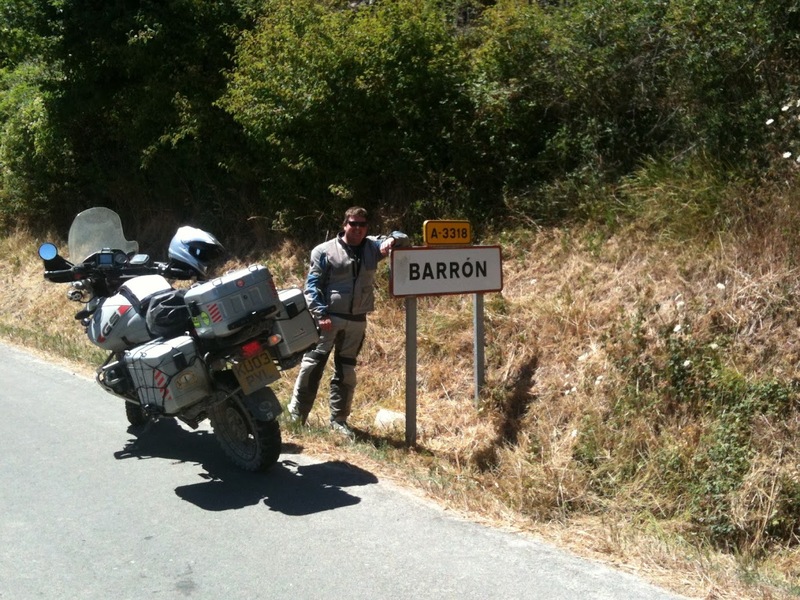 I had spied another little village a few miles further up the road towards Bilbao that bore my surname and, as it was genuinely pretty much along the route I wanted to take anyway it seemed rude not to pass through and take the opportunity for a photo next to the sign! We ploughed on through the afternoon heat, the route twisting us around fields and forests, hills and villages – a massive variety of terrain. A quick glance in my mirror revealed the normal little “train” of bikes following along behind had disappeared and I pulled over to the side of the road to wait for them to catch up. Nobody came. A few minutes later Steve appeared and said Simon had a problem and had stopped a little distance back so we turned around and returned to where he and Dave were stopped at the roadside. Simon’s chain had come off. However, not only had it come off, but it had doubled back on itself and jammed hard up around the front sprocket and didn’t look like it was going anywhere. After half an hour or so of poking, sweating, swearing, head scratching and a liberal application of brute force Dave finally managed to prise the jammed links free and, with some adjustment of the rear wheel, the chain was reattached. Luckily it hadn’t snapped, it had just jumped off the sprocket – Simon would later admit that not only had he never adjusted the chain in the 3 or 4 months he’d owned the bike, but that he didn’t have the tools or the knowledge to do so. Poor prep dude, poor prep! 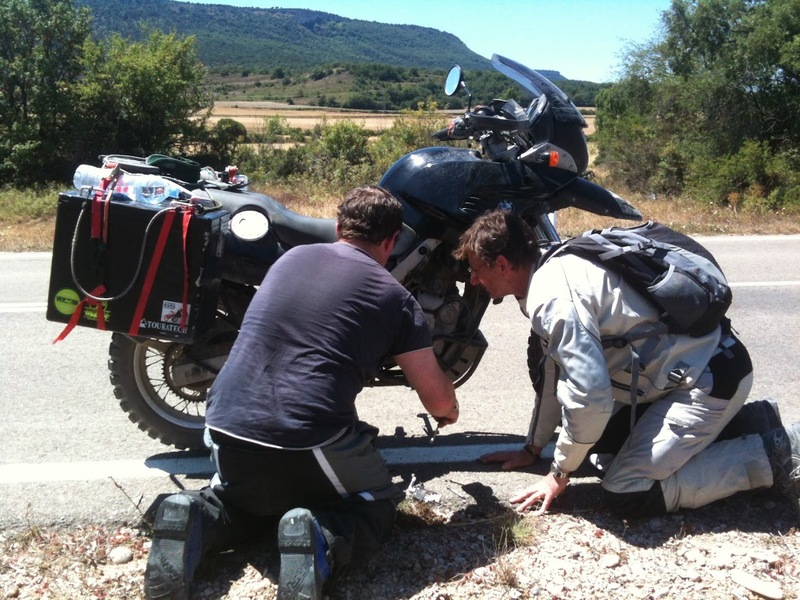 Yes we all share tools and knowledge on trips like these, it’s a team effort after all, but at the very minimum you need to carry the tools and the know-how to at least carry out the most basic running maintenance on your own bike. Fortunately between us we did have the right size spanners to adjust Si’s rear wheel, but if we hadn’t then he’d have been in a spot of bother for sure. We pushed onwards towards the coast, glad now that the ferry wasn’t until the morning and that we had a buffer of time for these little incidents – particularly as our last campsite was one that I wasn’t 100% sure even existed! I had seen it mentioned online, I think there was a “pin” also on Google maps, but I couldn’t find any firm details beyond that. It was however the nearest one I could find to the ferry port meaning we’d only have a short ride in the morning. If it was there of course! A couple of hours later we were a stonesthrow from the coast, although the terrain was still really mountainous with lush fields and forests, very reminiscent of Switzerland, when the Gremlins struck again. Dave dropped back and a few toots of his horn brought the group to a standstill at the roadside next to some gates belonging to a very nice looking house. His electrical problem, the one the Yamaha dealer back towards Pamplona had said they couldn’t find any trace of, had resurfaced. Strangely we were an almost identical distance away from where we needed to be as when Dave had broken down on the very first evening of the trip en-route to Camp 1. Suddenly 18 miles seemed like a very long way again. This time however there was at least a better plan to get us to where we needed to be. Steve and Dave set about stripping the luggage and seats off their bikes. Dave’s problem, a flaky Regulator/Rectifier (the little electronic box responsible distributing electricity around the bike and ultimately charging the battery) was the problem. If it stops working then the battery stops charging and, once the bikes systems (electronic ignition, ECU, fuel injection, fuel pump, lights, etc etc) have drained the battery then the bike will run incredibly rough and eventually stop. Quick Fix when you have two identical bikes on the trip: Swap the Batteries! Steve’s fully charged “Donor” Battery should have plenty of charge to see Dave to the coast and most likely on to the ferry in the morning. Meanwhile, Steve’s bike with it’s fully functioning Reg/Rec would charge up Dave’s flat battery which could be swapped back in later. Everyone’s a winner. No scary towing required! The swap was quickly accomplished and we were, once again, on our way. Now the nerves started jangling a bit. Would the battery hold up for the remainder of the distance. Sure it was less than 20 miles… but only if the campsite was actually there! We carried on, the terrain surprising us all in that despite being so near to the coast the mountains just kept on coming and coming. There were twisty forest roads leading us up and up when we felt sure we should be heading down towards sea level. Any other day and we would have revelled in the interesting riding, but now we all just wanted to get to camp without further incident. 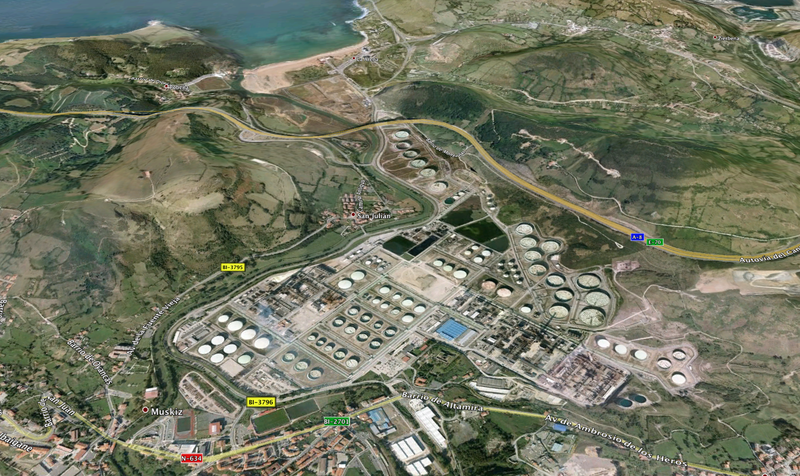 A few minutes from the coast at La Arena and our little mountain road emptied us out below a motorway flyover and into a weird landscape of apartment blocks and huge fuel stores all wedged into a small valley. Our road snaked around the fuel stores, under the motorway high above us and out onto a long straight road towards where I knew from the TransEnduro satellite there was a nice looking beach. However, despite being late afternoon/early evening on a Monday, the road was crammed with parked cars, jammed in at all angles to every tiny space they could fit and, the nearer we got to the beach the more crazy the parking situation got. It must have been a Bank Holiday Monday or whatever the Spanish equivalent is. This wasn’t the quiet spot I was hoping for and, judging by the look of the place, it was seeming increasingly unlikely that my little campsite would be where it was supposed to be. A few hundred yards of pedestrian dodging along the crowded beachfront later confirmed my fears. No campsite. Just another very overcrowded carpark where I had expected to see tents. Shitbags! Now we had a little problem. Not a massive problem as I did have a “Plan B” campsite lined up for just such an eventuality, but more that it meant we had to nurse Dave’s bike a little bit further, and in the wrong direction for getting back to the ferry in the morning. A quick reassignment of the TomTom showed we had another 16 miles to do, so off we went. 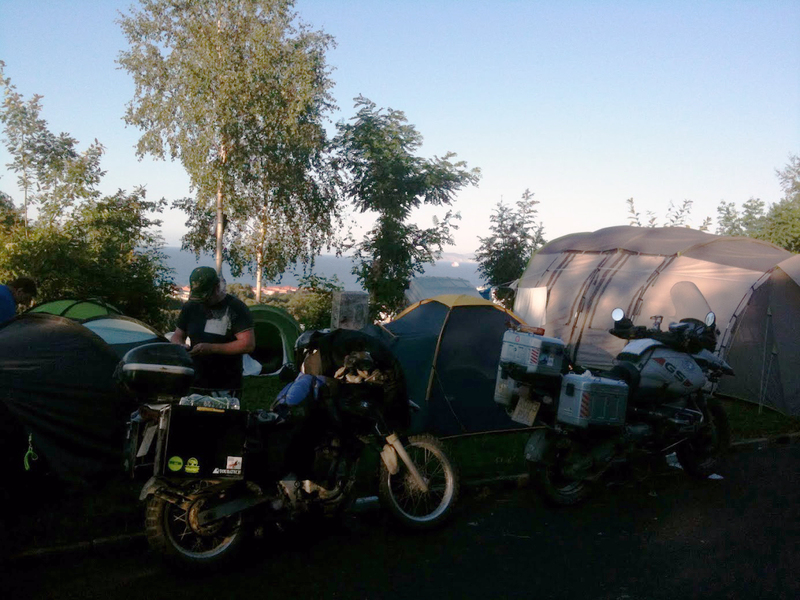 The whole trip had been planned to avoid motorways, however now our situation dictated we needed to get to Camp as quickly as possible before Dave’s bike flaked out again so I took the decision to hop on the motorway. Easier said than done though in the maze of sliproads and roundabout that followed with the signs saying one thing and TomTom telling me another. We racked up a good 5 or 6 miles of wrong turns and doubling back before we found ourselves heading in the right direction for Camping Castro. It was another nerve jangling ride, not least because there was very heavy traffic on the motorway and at one point it completely ground to a halt so we found ourselves filtering through the stationary traffic. Our junction eventually loomed ahead and we turned off and became immediately lost in the small town we entered. A few more wrong turns later and I spied the sign for the campsite and followed the road, through a tunnel and up a hillside until we saw the camp ahead. Made it! Well, sort of. It took a good 3/4 of an hour after we arrived before we were able to be “processed” and assigned a tiny pitch, perched at the very top of the steeply terraced site. However, there was a great view out to sea towards the ferry port from up there and we made good use of the bar while we waited! After pitching the tents for the last time on the trip and swapping the batteries back over on the Yammies Dave decided that the nerve wracking trip back to the boat in morning may be a bridge too far for the ailing Tenéré and, literally, made the call to arrange a recovery truck to take him to the ferry. It was the right thing to do really, we couldn’t afford another breakdown en-route there in the morning and jeapordise one or all of us missing the boat. That arranged, we hit the bar for the last time, watched the sun set and sunk a few well earned beers along with the most awesome of campsite burgers we had yet come across! Despite the huge and tasty burgers, the site itself was tired and in need of a few €€€€’s spending updating the facilities – it was however the cheapest site we stayed on throughout the whole trip and one of the nearest to the port so we’d probably use it again if need be. It wasn’t the ideal way to end a trip, or to start a trip for that matter, but Dave seemed to have genuinely enjoyed the bits of “proper riding” that we’d done together. 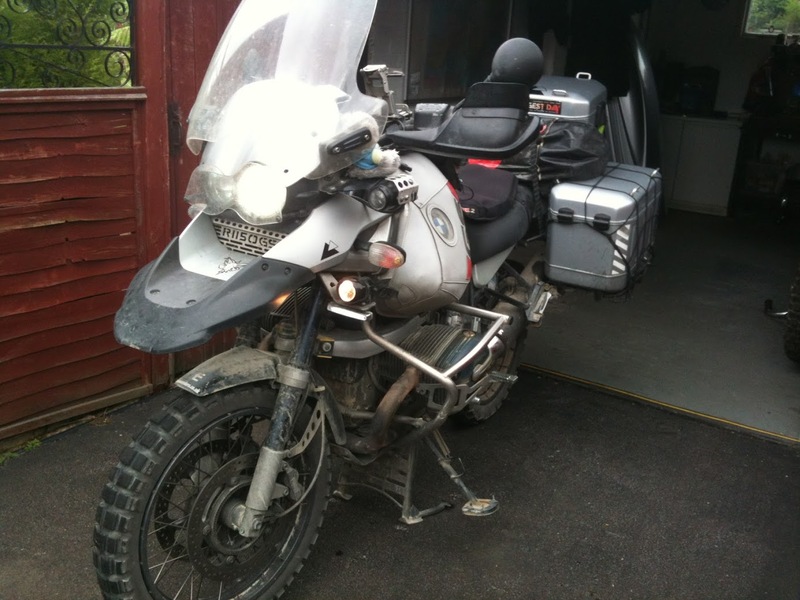 My greatest fear was that after all the fanfare and all the build-up that his electrical misfortunes might have put him off touring, or adventure bikes in general. But thankfully that’s not the case and he’s at the head of the queue for next years big trip! The Tenéré has been sold on to make way for a very clean and shiny Triumph Tiger XC800, which looks like just the job for trailblazing and Col Bagging!